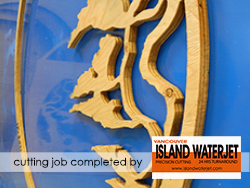 Waterjet Cutting technology is classed as a GREEN TECHNOLOGY. The process is essentially the same as water erosion found in nature but greatly accelerated and concentrated. The power of the water has capability to slice through virtually any material from paper thin up to 8 inch thick material from plastic to titanium. 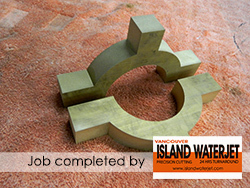 Waterjet is extremely powerful capable example cutting up to 8" thick stainless steel. It incorporates a very small diameter cutting stream (approx. 1mm or 0.040") allows it to produce tight corners with very high tolerances. 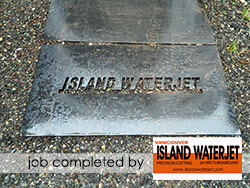 Waterjet is a "Cold Cutting" process that produces no heat affected zones ( HAZ ) or burnt edges. These factors mean that there is little or no secondary operations required for most applications. Exotic materials such as titanium and alloy steels are easily cut with no need to pre-drill holes. 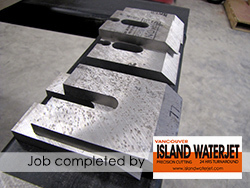 Waterjet will pierce straight through stacked sheets, plastic coated materials, composite materials, ceramics, and just about any other materials known to man. 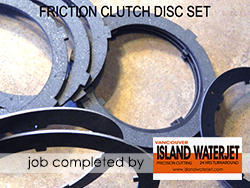 With low cutting forces clamping is kept to a minimum. 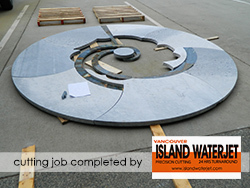 Waterjet cutting of all natural and manmade stones is simple, fast and highly effective. The very small stream size (approx. 1mm or 0.040") enables intricate patterns to be cut out, while the extremely high pressure (up to 60,000 psi) ensures thick materials (up to 8" thick) can be easily cut. 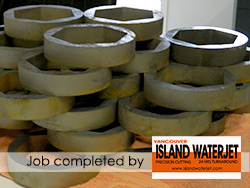 Extremely efficient and cost effective. "Low Pressure" piercing functions ensures that even the most delicate or brittle materials can be pierced without the need for pilot holes. 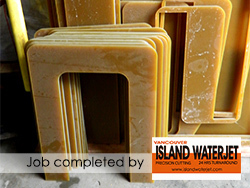 Can be used for a range of applications including; kitchen bench tops, vanities, kitchen and bathroom backsplash, tiles, etc. 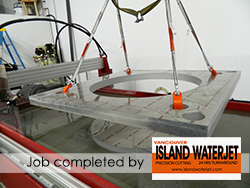 Glass cutting is an ideal application for Waterjet Cutting. We can go from cutting the most delicate led light glass, through to the strongest thick glass. The very fine cutting stream (approx. 1mm or 0.040") enables cutting of almost any shape no matter how fine or intricate with almost no load from the cutting process being applied to the glass. 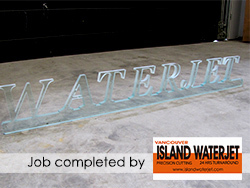 Glass cutting with a waterjet is extremely fast, able to cut 6mm glass in excess of 1000mm/min. 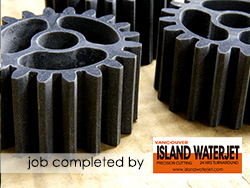 Ideal for cut-outs, holes in backsplashes and all architectural applications. 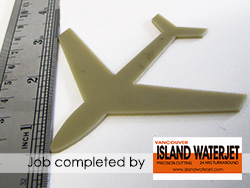 Waterjet Cutting is ideal for many foam, rubber, plastic, insulation and woven materials. With an extremely fine cutting stream (approx. 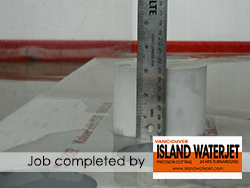 1mm or 0.040") very tight nesting and therefore good material yields can be obtained. 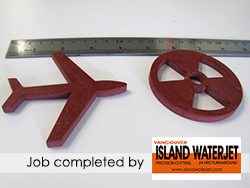 Waterjet is great for stack cutting, with thickness up to 8" commonly achieved. Multiple cutting heads and conveyor feed systems along with high acceleration and cutting speeds of almost 1000"/min (400mm/sec) result in high production throughout. door components, instrument panels, etc. sound insulation, vibration isolation, archery targets, etc. * Natural Rubber, Plastics, Cork, etc. 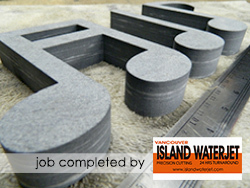 The versatility of Waterjet Cutting makes it ideal for the manufacture of gaskets. Capable of cutting anything from hardened spring steels, to non ferrous materials such as brass and copper to delicate graphite composites and papers.